Nevertheless, you’ve got to appreciate the attempt to do something different with these characters and situations. I am a dedicated follower of these animated Batman films targeted at a more adult audience. I have Batman Year One, Mask of the Phantasm, Under the Red Hood, Gotham By Gaslight, Mystery of the Batwoman, Gotham Knight, Assault on Arkham, Batman Vs Robin, Son of Batman, Bad Blood, The Dark Knight Returns – Parts 1 & 2, The Killing Joke, Superman/Batman: Apocalypse, Superman/Batman: Public Enemies, and a few of the Justice League titles in which Batman is prominent in the storyline. They are generally of very high standard; certainly, a line that DC excels in. 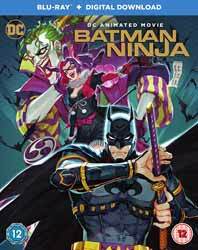 Okay, this one is no Batman Year One, or The Dark Knight Returns, but is a slightly above average release and worth seeing.